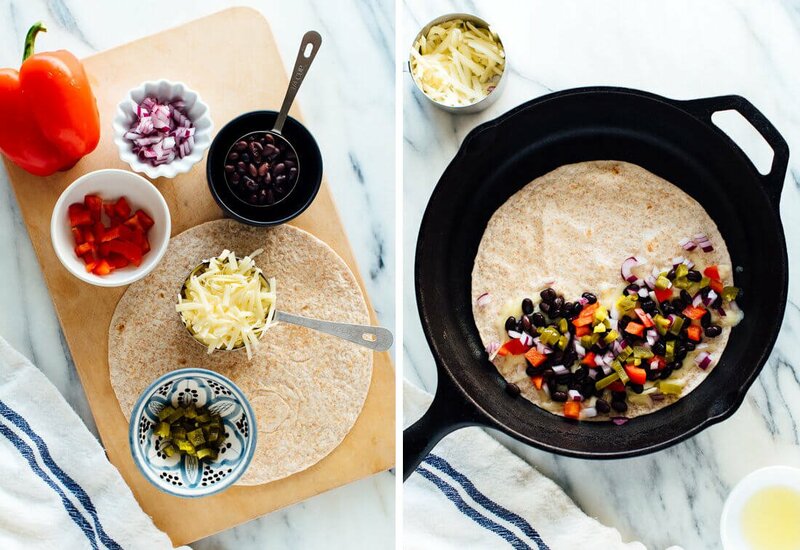 It’s about time you met my go-to meal, the quesadilla. When I’m feeling too lazy to make a proper meal, when my fridge is bare, when I come home from the grocery store hangry—I throw together a quesadilla in under ten minutes flat. How have I not shared my basic quesadilla recipe, in all these years of food blogging? I’m righting this situation today by sharing my favorite quesadilla, lots of quesadilla-making tips, and fun ways to change up your quesadillas. First up, a brief history lesson! Quesadillas came to be when Spaniards brought dairy products (not to mention, cows) to Mexico in the 1500s. Mexicans combined cheese (queso) with tortillas and created a number of delicious combinations, including the quesadilla. In its most basic form, a quesadilla is simply a grilled tortilla with melted cheese inside. It’s the Mexican grilled cheese, if you will, and you can add additional fillings if you’d like. My favorite quesadillas, however, are not the super buttery, ooey-gooey quesadillas that you might have ordered at a Tex-Mex restaurant and later regretted. 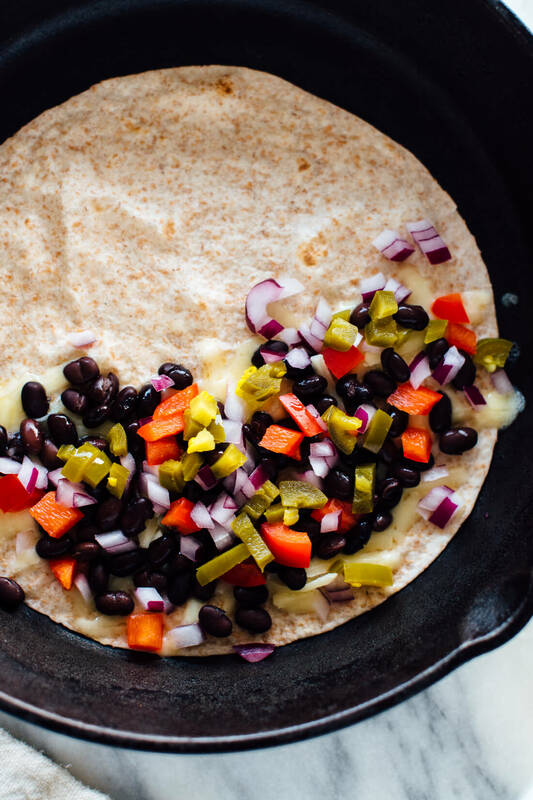 These quesadillas are packed with veggies and some beans for protein. I make them with whole-grain tortillas for some nutritional bonus points and add enough cheese to make sure they’re both enticing and delicious. That’s why I generally make a quesadilla instead of ordering pizza—they’re quicker and hit the spot. Use one tortilla per quesadilla. Then fold it over on itself to create a half-moon shape. You can make two quesadillas at once this way, nestled in the pan with their folded sides next to each other. Giant, round quesadillas made with two tortillas are too tricky to flip and slice. Choose your cheese carefully. Freshly grated cheese (as opposed to pre-shredded cheese) melts best. I prefer cheddar cheese to Monterey Jack, since cheddar is less gooey and produces a more firm, easy-to-slice quesadilla. If you want to go the traditional route and can find it, use Oaxaca cheese! Use a medium-to-large skillet. Be sure your pan is large enough to accommodate the quesadilla lengthwise, so it can get nice and toasty from end to end. Don’t crank up the heat too high. You want a moderate heat that will slowly melt the cheese and crisp the tortillas without scorching them. Reduce the heat as necessary and then make sure to cook each side long enough that they get deeply golden and crisp. Crispiness is key. Oil/butter is optional. I often cook my tortillas in a cast iron pan without any oil at all—they’re less likely to burn that way. Just barely frying the outsides with a light brush of oil or melted butter is a nice touch (I included instructions for how to incorporate oil/butter in the recipe below, but you can certainly skip it). Add beans. I like to include cooked beans as a protein-rich filler that lightens up the cheesy-carby elements. It seems like a more well-balanced, full meal that way. Chop up your fillings. You can’t sandwich large hunks of ingredients in a quesadilla—they’ll fall out, and you’ll end up with hot cheese dripping down your chin. Awkward. Chop them up small! Bonus tip! For a cheesy flavor explosion, sprinkle a little bit of cheese on the outside of the quesadilla, let it melt, and then flip it so the cheese fries against the quesadilla. Repeat with the other side if you’d like. This works best on non-stick surfaces and might make a delicious mess regardless (this is also a great trick for grilled cheese sandwiches). You can find more detailed instructions in my crispy mushroom, spinach and avocado quesadillas recipe. 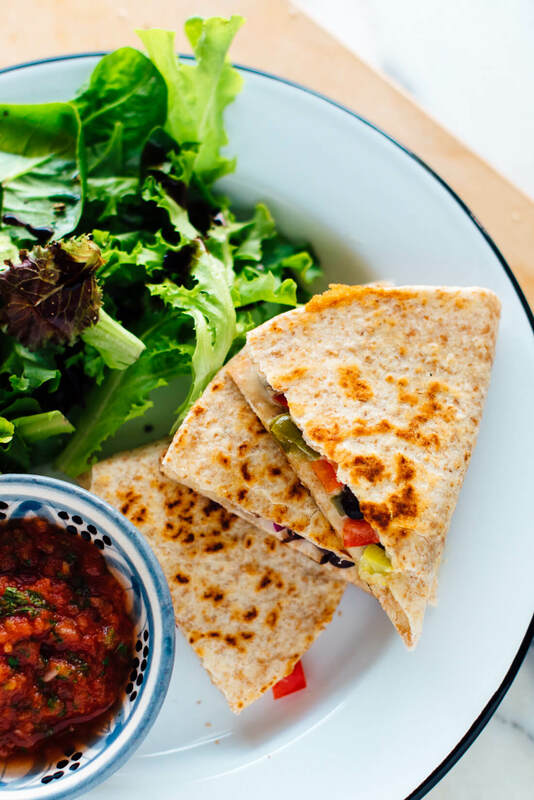 Quesadillas are the perfect quick meal. Enjoy this vegetarian quesadilla recipe in under 10 minutes! Recipe yields 1 quesadilla (3 slices), so multiply as necessary. Heat a medium skillet over medium heat. Warm your tortilla for about 30 seconds, flipping halfway. Flip once more, then sprinkle one-half of the tortilla with about half of the cheese. Cover the cheese evenly with the remaining fillings: beans, bell pepper, onion and jalapeño (if using). Sprinkle the remaining cheese over the fillings, and fold over the empty side of the tortilla to enclose the fillings. Quickly brush the top of the quesadilla with a light coating of oil, then carefully flip it with a spatula. Let the quesadilla cook until golden and crispy on the bottom, about 1 to 2 minutes, reducing the heat if necessary to prevent burning the tortilla. Brush the top with a light coating of oil, then flip it and cook until the second side is golden and crispy. 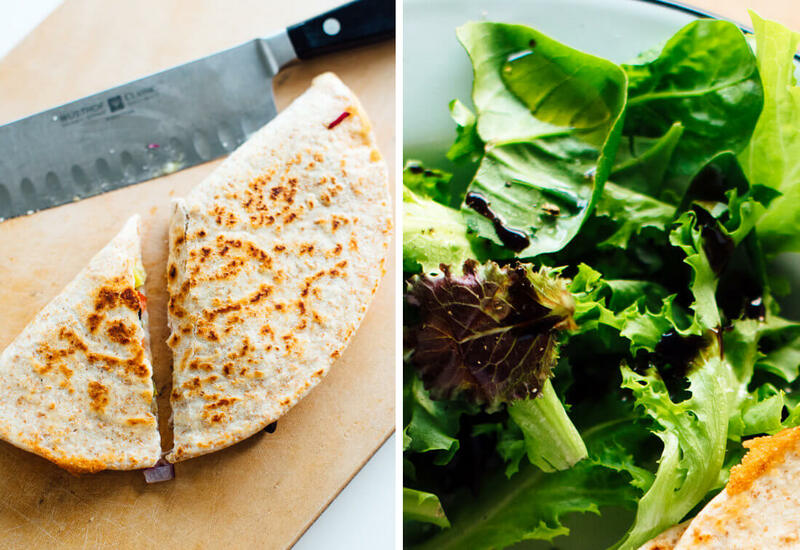 Immediately remove the skillet from the heat and transfer the quesadilla to a cutting board. Let it cool for a minute to give the cheese time to set, then use a chef’s knife to slice it into 3 pieces. Serve promptly, with any sauces or garnishes that you’d like. Change it up: Replace the fillings I used here with a handful of any of these options: raw or cooked chopped vegetables, sautéed greens, fresh leafy herbs, chopped olives or pepperoncini peppers, you name it. Cheese notes: You can substitute any melty cheese (Monterey Jack, mozzarella, traditional Oaxaca—no need to grate the Oaxaca cheese) for the cheddar. You could also add crumbled feta or goat cheese, if you’d like. Favorite tortilla brand: I love Stacey’s Organic, which doesn’t contain any crazy preservatives. I usually store them in the freezer so they last longer, and defrost individual tortillas as necessary. Make a basic cheese quesadilla: Just skip all of the other fillings listed! Make it gluten free: Use a certified gluten-free tortilla. Make it vegan: Omit the cheese and spread ¼ cup cashew sour cream (see my cookbook, page 217) or hummus over the tortilla (check out these hummus quesadillas), and use oil instead of butter for brushing. 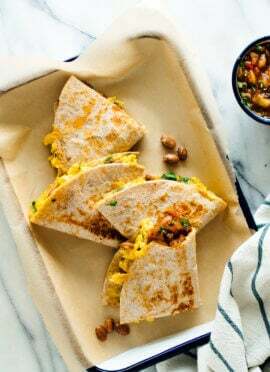 Storage suggestions: These quesadillas are at their crisp best right after making, but they will keep well for about 4 days in the refrigerator, covered. Gently reheat in the microwave or oven before serving, if desired. If you love this recipe: I have more quesadilla recipes and Mexican recipes for you! 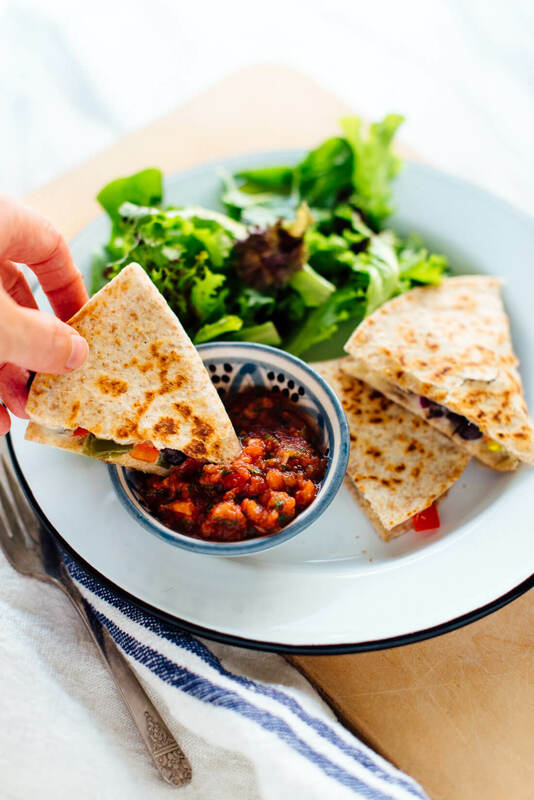 Don’t miss the greens and beans quesadillas or everyday red salsa in Love Real Food—they are epic. That sounds like quite a quesadilla! Thanks for sharing your version, Judith! Especially love the idea of incorporating bean dip. Woah! Just read through my recipe and that should be red ONION crescents! Just be sure to cook your flour tortilla so it gets flaky and done. I know people like those plain flour tortilla roll-ups with cream cheese & other fillings, but to me it’s like eating uncooked dough! Jalapeños and black beans! Two of my favorite things. These look delicious and easy. YUM! 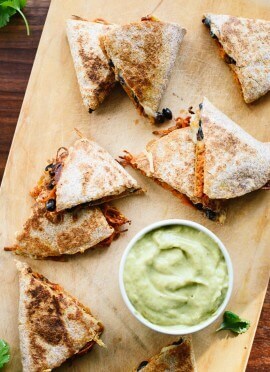 Love the suggestion of subbing veggie quesadillas for when that “pizza craving” hits, def will try next time. Great way to use up leftover veggies too! For sure! 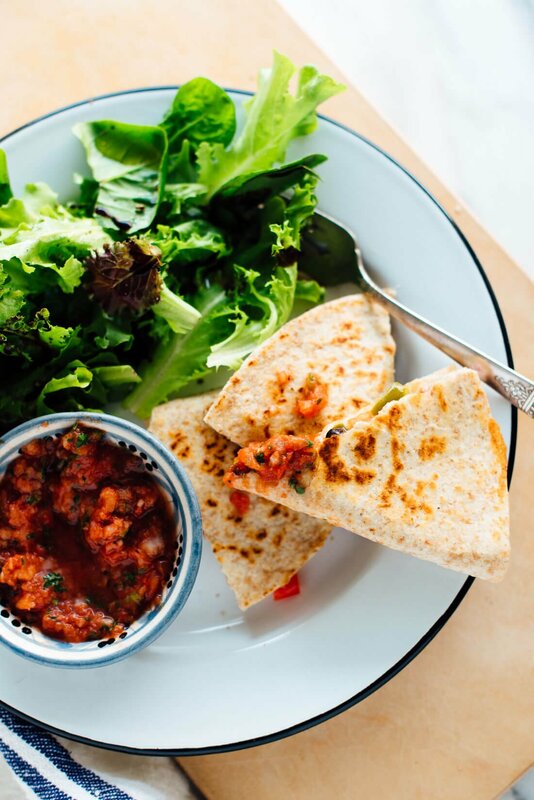 Hope you give these quesadillas a try soon! Wow!! !This sounds delicious and looks even prettier! Thanks for sharing. What are your favorite whole grain flour tortillas? Good question! My favorite is Stacy’s brand, which I find at natural food stores, usually in the refrigerated section. I usually freeze mine so they last longer and defrost as necessary—although, sometimes they get stuck together during freezing. I like to saute my vegetables first when making these. That allows me to get everything cooked down first, which means I fit more vegetables in my quesadilla. Spinach is especially good for this because you can add 2 cups and have it cook down to about 1/4 cup worth of space! Great point, Kate! I hadn’t thought of that in terms of vegetables. Awesome! Have been making a lot of these lately as a snack for my daughter when she returns from school. I prefer using a Panini press for the perfect compression and also spread a bit of butter-like spread for the toasty grill marks. Ooh, that panini press sounds like fun! 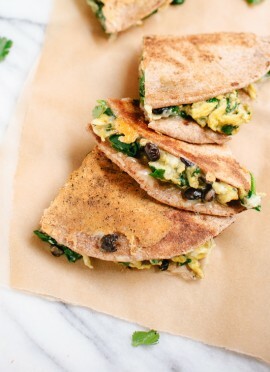 Great timing for me, as I’ve been looking for some fresh and flavorful, but cheeseless quesadilla ideas. Looking forward to this, it looks delicious! Enjoy, Connie! I’ve been pleasantly surprised by how much I’ve loved the vegan sour cream and hummus options! In a pinch to make something and an email with this recipe arrived just in time AND I had all the ingredients. Really, really good! Thank you! Perfect! Thank you for commenting, Bill! These look delicious! Cashew sour cream sounds really delicious in this recipe! Glad that it can be veganized so easily! Thank you Kate for one, delicious quesadilla! I just made this for my husband who just had knee surgery and he can’t stop mm’ing and yum’ing! This meal put a smile on his face when he’s been in so much pain. I tried this recipe with Trader Joes “flour and corn” tortillas and made your simple guac recipe for dipping. This recipe’s a keeper! Katie, I hope your husband is healing well! I’m so glad he enjoyed the quesadilla. I love beans, so I know I will love this recipe. But the thing that caught my attention was your salsa!!! Love quesadillas, but would never give up on making pizza. I also can’t imagine trying to grate Oaxaca cheese. We bought some of that recently to make quesadillas with epazote (Ali -gimmesomeoven.com), and it melts gorgeously, but we do that as a chunk of cheese. Quesadillas are a wonderful invention – I have a couple that I make regularly. Yours will add one more to my options, and I think it would be wonderful with any of the cheeses mentioned. Thanks, Susan! No need to try grating Oaxaca cheese; I added a note to the recipe about that. Hope you enjoy this variation! I got a quesadilla maker for a wedding present. I thought it was kind of silly, but I really like it. I use it a lot more than I thought I would. I’m glad you’re enjoying it! I’ve never tried one, but sometimes a good kitchen gadget makes a world of difference. These look delicious! We eat quesadillas a lot at our house; I’m thinking they’ll be on the menu again this week! Made a bunch of these for work this week – they pack easily and were quick to cook up! Thanks for the inspiration. Its Hatch Chile season in New Mexico right now. These would be great with some roasted and peeled Hatch Green Chiles substituted for the pickled jalapenos… if you’re in an area where they’re available. I like the way you think, Cory! Great quesadillas, and with more vegetables than my usual version, which I consider an improvement. I was suspicious of using raw onion and red peppers, but it worked fine. I love it that these take only 10 minutes. For me, that’s a huge bonus when it comes to making recipes. They look good. I could really do with one of these after the grocery store hangry sets in (I can totally relate to that description). Nothing better than a quick quesadilla. These look so yummy with all the ingredients chopped up small. Thanks for sharing. Quesadillas are a favorite in my family. I followed the recipe pretty closely, but love all the options and suggestions for how to change it up. These are a life-saver! It is so good to know that you can whip up something healthy in 10 minutes, that taste great… Made these more than I can count. It’s nice to have something! Thanks for the review, Samantha. Thanks for trying this recipe and adding your own variation, Linda! I appreciate your comment and review. Very tasty and easy. Enjoyed buying a new ingredient – pickled jalapeños. They definitely add the right amount of spice and flavor. Definitely a keeper recipe. They are so great with this. Thanks for sharing, Liz. If you would want to leave a star review, I would appreciate it! This was delicious, thanks so much for the inspiration! I used the cashew sour cream instead of cheese (added the nutritional yeast so it was still cheesy-sequel). For filling I sautéed some red onion, bell peppers, jalapeño, spinach, and black beans. Everything was delicious! Made a bunch of filling so I can put it in the fridge and have dinner planned for the whole week. Thanks again!! That should say “cheesy-esque”, not cheesy sequel. Oops. Great substitution, Jenny! Thanks for sharing. If you would like to leave a star review, I would appreciate it. Normally I use msoorbeans n corn. Instead of the griddle, I make in sandwich press, easy to use no sticking or burning issues. I combined all my veggies in a bowel and added cilantro and some taco seasoning before I started so the ingredients took on a cohesiveness. I liked the specific instructions regarding heating up the tortillas though, that was new to me and and worthwhile. This would actually be a great breakfast, lunch or dinner in our house! Now I’m hungry! Yes! This recipe could work for all three. Thanks for your review, Bee.